Ok, pub crawl is a slight exaggeration as I had two halves of cider (go steady!) and we visited a total of two pubs. We checked out The Old Bank first which has a real old pub feel and serves real ales and craft ciders. I sampled the Lily the Pink cider which was delicious – it went down a treat! We also visited The Fishpond which is a favourite of ours as it is a venue for local bands and the destination for the office Christmas party – my mum and dad even had their night do there! There’s a great seating area outside which is perfect for when the weather’s fine and I’ve also sampled lunch here a few times and the food is really good. You can’t come to Matlock Bath without spending some money on the slots. The main road is full of them with every single machine you can think of. We played each other at air hockey, tried to win a cuddly toy, struggled to understand the fruit machines and spent countless 2ps on the flippers. The house always wins but it’s so much fun! There are plenty of fish and chip shops to choose from in Matlock Bath. This time we went to The Promenade which, for once, wasn’t too busy, and we managed to get a seat outside. The food was great – I had a chicken and mushroom pie, chips and mushy peas with plenty of salt and vinegar – yum! During September and October, Matlock Bath rivals Blackpool (well, kind of) for its illuminations. There is a parade of illuminated boats on the river and a fireworks display on a Saturday evening. The fireworks start at around 9pm and last around 15 minutes. They’re a really good display with some big bangs and an awesome finisher at the end. Top tips from a local: it’s always super busy on fireworks nights so park in Matlock and hop on either the park and ride bus or the train to save searching for a parking space. The best place to watch the fireworks is at the back of The Fishpond. Walk up the hill and find a spot overlooking the pub and The Pavillion opposite – perfect! 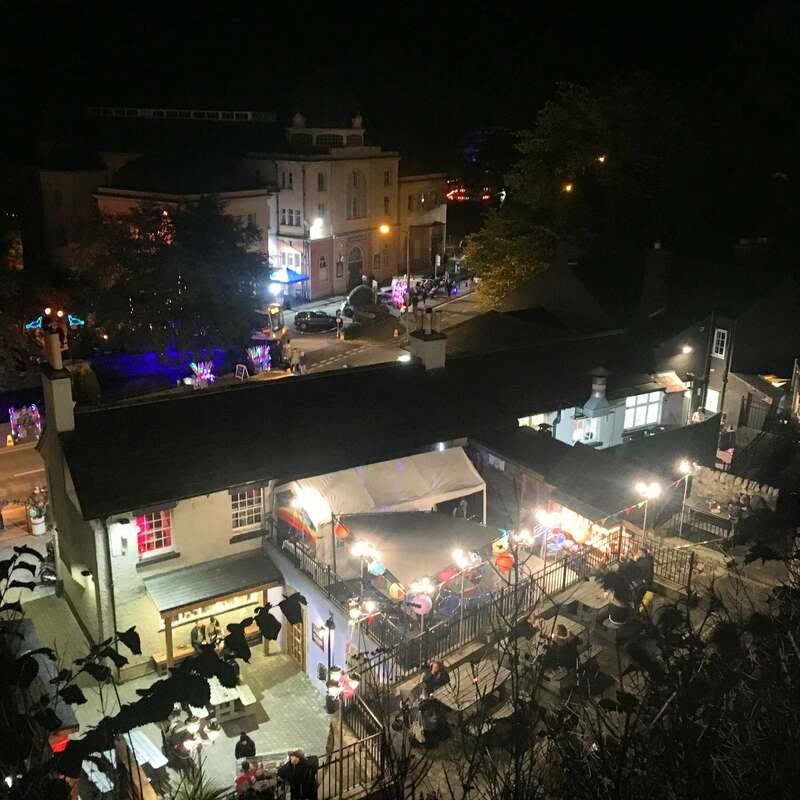 For me, Matlock Bath Illuminations marks the start of autumn as it’s usually the first night of the year that I wear a bobble hat – fireworks, Halloween and cosy nights in! Matlock Bath is basically good old fashioned family fun at its best and I love it! Have you visited Matlock Bath yet? Let me know your thoughts in the comments!